Anne of Green Gables said it best when she said, “I’m so glad I live in a world where there are Octobers.” I love October back in the States. Nothing says fall more than putting on a sweater, sipping some classic Pumpkin Spice Lattes, seeing photosynthesis in action, and hearing the crunching of leaves under your feet. However, this year October has taken on a new meaning. This year October means daily seventy-degree weather, Día de Guayaquil (this Friday), hiking, and the Galapagos to name a few. It has been very difficult to not miss all the things fall has to offer back in America, but I keep reminding myself that I could possibly spend every fall for the rest of my life in the States, and then I feel lucky to be abroad. Instead I wear tank tops to class and realize Ecuador’s idea of October ain’t half bad. 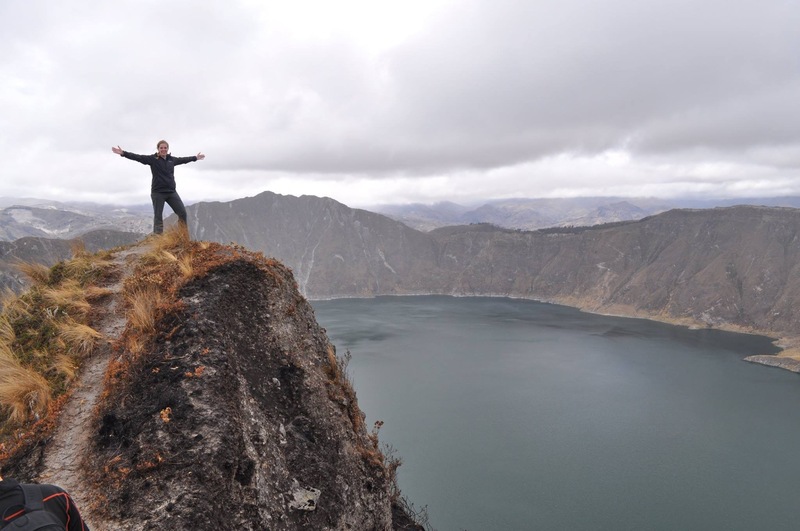 I know I have been writing about breath-taking views in basically every blog entry, but Quilotoa takes the cake. If you can imagine volcanic craters, horseback riding, hiking, an indigenous community, and kayaking all in one weekend, then you have a pretty good picture of my weekend. In order to relay all my excitement about Quilotoa, please allow me to go into story-telling mode. 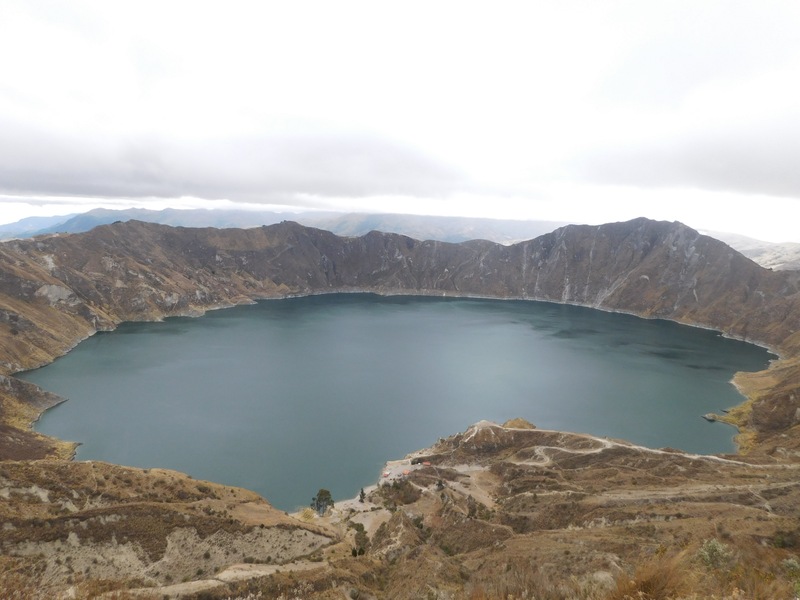 After taking four different buses, my eyes finally met Quilotoa. Immediately we experienced a different climate as we were standing 14,000 feet above sea level. Jackets and gloves became a necessity, but the view made it worth it. Our guide told us we were going to walk to the bottom of the crater to go kayaking. My mind did not think I would be basically skiing down a sand dune, but then again I never know what to expect here. After skating and tumbling down the sand, we finally reached the bottom. 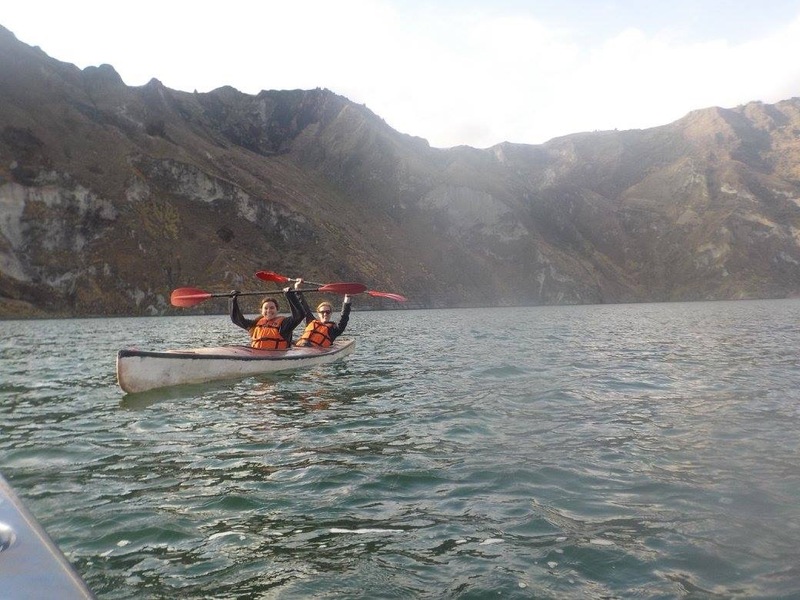 Kayaking inside the volcanic crater was an extremely surreal moment. I sat in the kayak looking around thinking to myself: I’m sitting in a kayak, inside a volcano, 14,000 feet above sea level, in Ecuador. Not a bad day. Side note: when you find out the bathroom at the bottom of the crater is a shack with a hole in the bottom of the floor, you suddenly do not have to go anymore. After my little kayaking adventure, it was time for a new adventure. 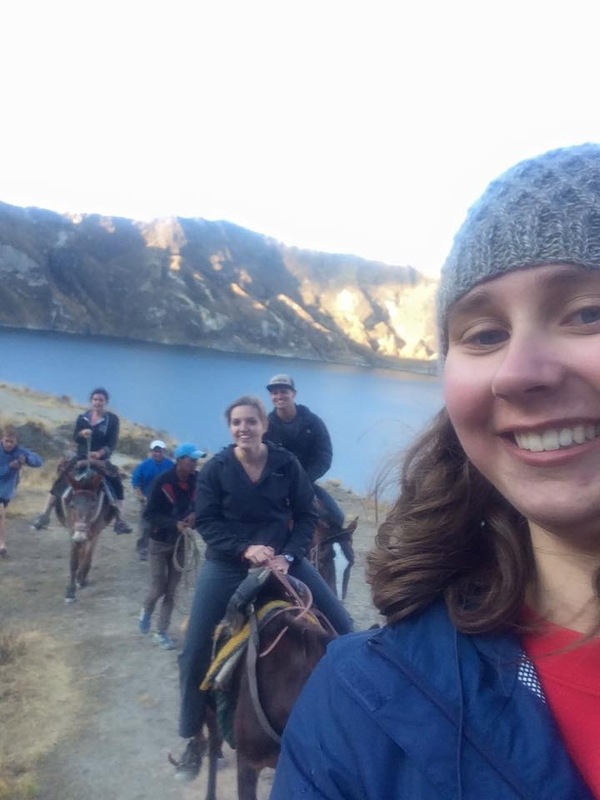 My friends and I found the daunting task of climbing up the side of the crater impossible, so we confided in mules instead. The Ecuadorian man simply gave me the rope attached to the mule, and let me go. No instructions, no consent form, nothing. When in Ecuador, right? Having no previous horseback riding experience, I did my best to imitate the old Western movies. I swung my leg over the mule and off I went. Not only is it terrifying to be on the back of a horse/mule for the first time, but try doing it on basically the side of cliff. Naturally, I named my horse Don Diego and coaxed old Donny up the crater. Sunday morning we headed out to the trail, but not before we bought Alpaca gloves (3 pairs for $10) from an indigenous woman. You feel more like a group when you all have matching gloves. We had a slow start because at 14,000 ft. your body does not want to go hiking, but once we got moving we were fine. The trail was pretty scary at times because at some parts we were basically scaling the side of a cliff. I literally felt like my eyes were lying to me. The views were remarkable, and I could not help but stand in awe of our Creator. 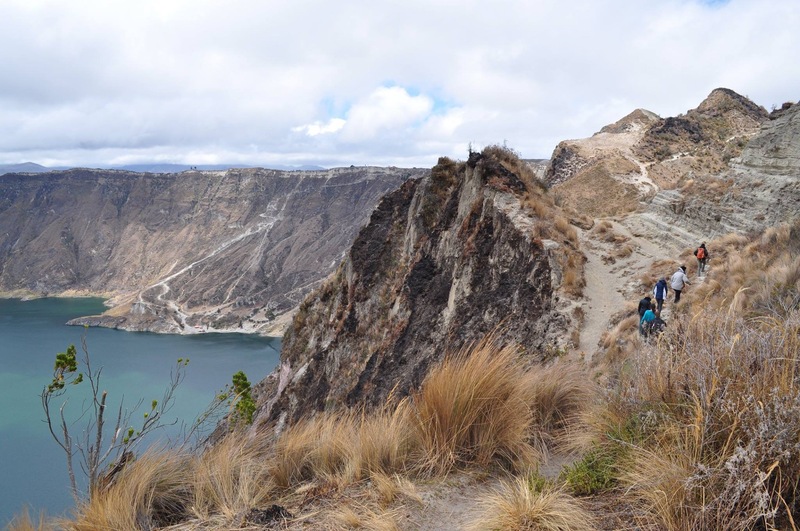 I am sure you have never heard of Quilotoa before now, and neither did I, which makes me wonder how many other incredible places there are in the world that I do not even know exist. So while October for me does not include football games, pumpkins and Halloween, I think for one year I will be able to exchange those things for volcanic craters, warm weather, and my impending Galapagos adventure.